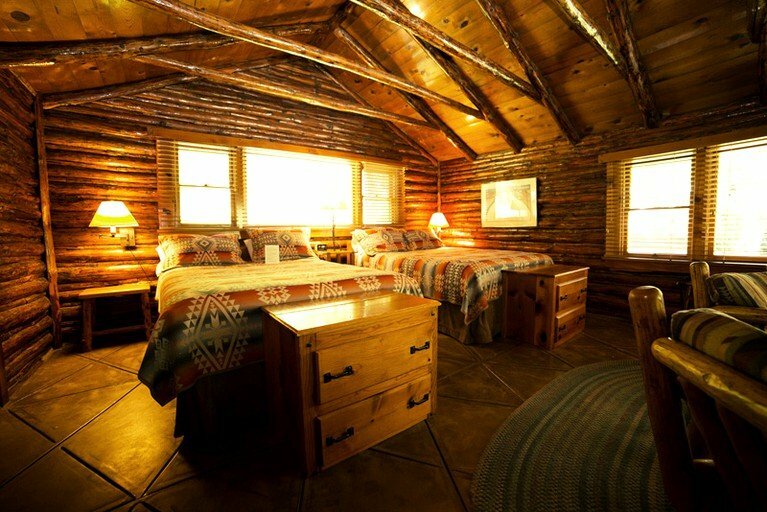 Enjoy a rustic getaway in this family-friendly cabin rental with luxury amenities for all to indulge in during a glamping stay in Sedona, Arizona. 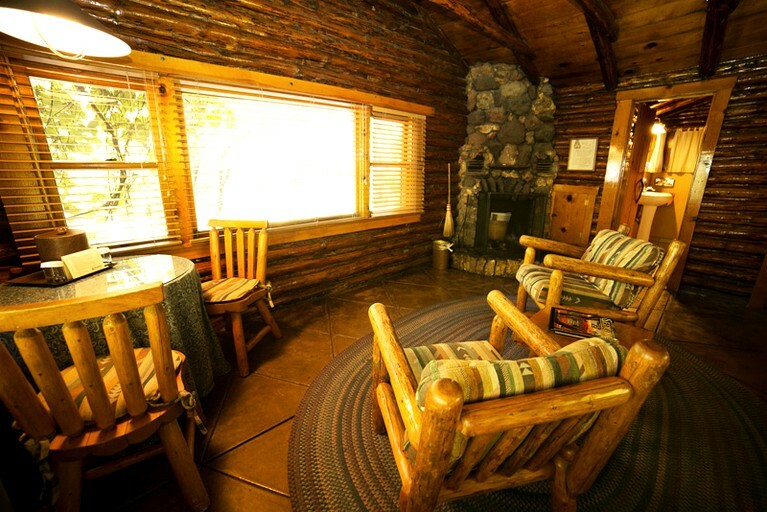 Surrounded by gorgeous foliage and towering trees, this quaint cabin rental offers luxurious Sedona lodging in a natural setting. 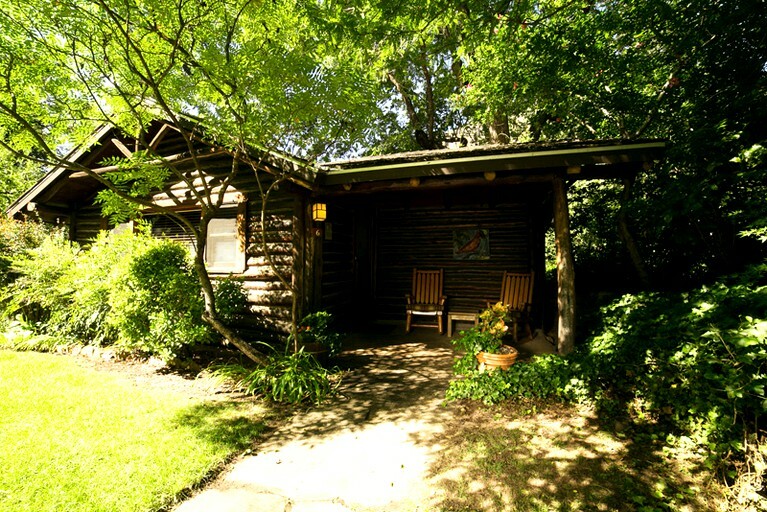 This cabin also features two queen-size beds and room for a rollaway bed, a wood burning fireplace, air conditioning, and the front porch looks out over the flower garden on the main lawn. The cabin amenities include labeled shampoo, conditioner, lotion, face soap, hand and body soap, and hairdryers. Irons are available upon request at the front desk. Rates are based on double occupancy and include a hearty, cooked to order breakfast, afternoon tea, and an elegant, four course dinner. There is a communal lodge where guests are served complimentary breakfast, afternoon tea, and dinner daily, so there is no need to worry about cooking—or cleaning up after! Cocktails are served at 6 p.m. on the lawn (weather permitting); dinner is served at 7 p.m.; and breakfast is served from 8 a.m. to 10 a.m.
All cabin amenities include Garland’s Label shampoo, conditioner, lotion, and face soap, as well as hand and body soap locally made by Body Bliss and Hairdryers. Irons are available at the front desk. The glamping site offers many package deals that are perfect for those who are looking for a little something extra. Why not try one of the Jeep tours from $65 per person. Glampers can choose from the Coyote Canyons Tour, the Broken Arrow Tour, the Ancient Ruins Tour, or the Grand Canyon Tour. Alternatively, enjoy a sun-drenched bike ride through Red Rock Country with spectacular views. Whether you’re looking for a leisurely sight-seeing ride or an all day adventure, for $115 riders can pick and choose their perfect bike tour. Experience the splendor of gliding over Mother Nature’s own beautiful, panoramic Red Rock Country and guests can treat themselves to some smooth flying of Red Rock Balloon Adventures, from $220 per person. For those who desire a calm, relaxing activity, enjoy a half day or full day fly fishing adventure from $195 per person, on Sedona's beautiful Oak Creek Canyon. Listen to the soothing sound of Oak Creek from an outside pavilion, while the amazing masseuses give you and that special someone an unforgettable one-hour massage. Afterwards, enjoy cold champagne and fresh strawberries. This is a package for two, at $265 per cabin. Last but not least, guests will be able to indulge in a delicious breakfast delivered to their cabin, including a bottle of champagne, strawberries and fresh orange juice for the perfect start to their day. This package is $70 per cabin. Wedding ceremonies can also be held on the lawn or garden areas, complete with a buffet reception or a sit-down wedding breakfast in the dining room or on the front lawn. The pools of Oak Creek are stocked with rainbow trout from May through to September, making them an ideal place for fishing enthusiasts. 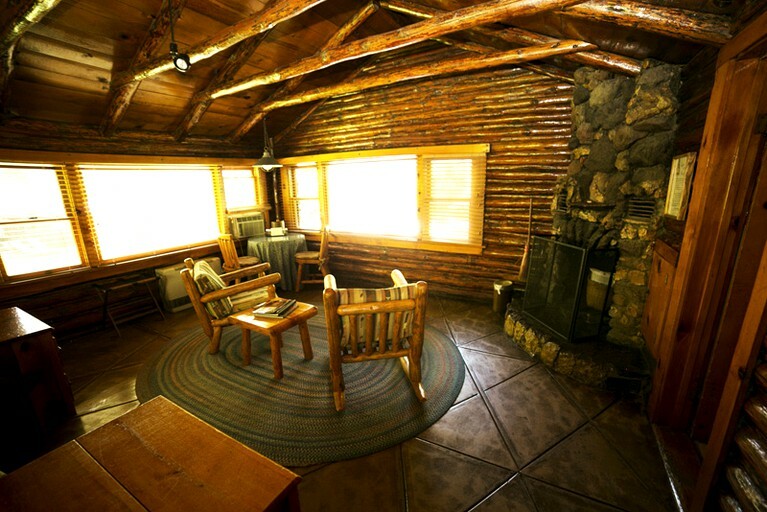 Slide Rock is fantastic for the whole family to enjoy a dip in the water, and Oak Creek Canyon offers many beautiful hiking trails that are a delight to explore for glampers of all ages and abilities. Guests who want to have a rejuvenating nature retreat can participate in the yoga classes offered on site, and for those interested in the local area, there are many sites to visit including Montezuma’s Well, Walnut Canyon, and Sunset Crater. A day trip can be spent visiting the Grand Canyon, or guests can stay local and enjoy the many shops and galleries in Sedona. Rates are based on double occupancy and include a full breakfast, an afternoon tea, and a four-course dinner daily. Dinner at this glamping site is casual but elegant, and may not be appropriate for small children. Parents can opt for their children to have the simple children’s menu at 17:30, then enjoy their evening while a babysitter cares for their child. Arrangements should be made in advance. Please inquire about pricing. There is a 15% gratuity will be applied to the final bill, which covers gratuities for the entire staff.